There are countless albums from hip-hop’s 45-year lifespan that may be classics, but still live within the genre’s rearview mirror. Sure, they will forever exist in our hearts and within the soundtracks our lives, but the word impactful is an adjective only reserved for a treasured few. On August 25, 1998, Ms. Lauryn Hill released her solo debut album The Miseducation of Lauryn Hill which became a standard for all impactful albums that have followed it. It arrived while hip-hop was undergoing a reinvention as a commercially viable genre, delivering an earthquake of an album whose tremors are still being felt today. It brought hip-hop to the mainstream. A year-and-a-half before The Miseducation of Lauryn Hill arrived, hip-hop lost the second of its legendary rap giants, when the Notorious B.I.G. was murdered on March 9, 1997, following the death of Tupac Shakur on September 13, 1996. As hip-hop scrambled for an identity—straddling the line between bangers and manageable mainstream offerings—it was Ms. Hill who released an album that could rule in both worlds. For those still spiraling over hip-hop’s intermittent and indiscriminate violence, it was easy to “other” the culture as a whole. Ms. Hill became a mainstream fixture; one that pop music preferred to claim. However, when Ms. Hill swept the GRAMMYs pop category the following year, she said during an acceptance speech, “This is crazy, because this is hip-hop music.” Ms. Hill not only kicked pop’s door in, on behalf of hip-hop, she made sure no one ever looked the “other” way again. It woke up the GRAMMYs when it came to hip-hop. It’s no secret that the GRAMMYs and hip-hop have had a fair-weathered relationship, as rappers have struggled to be adequately and respectfully recognized by the Recording Academy for decades. On February 24, 1999, Ms. Hill made history at the 41st GRAMMY Awards when she was the first hip-hop artist to win the GRAMMY for Album of the Year. She also was the first woman to take home five GRAMMY Awards in one night. Those were two milestones for the GRAMMYs, thanks to Lauryn Hill: one for hip-hop and one for women in music. Singing and rapping were always play-cousins, yet identifying both as “hip-hop” was something many struggled with. Perhaps it was the street hustler image of rap in the ’80s and ’90s mixed with the super-smooth romanticism of R&B in the ’90s New Jack Swing Era that made it so difficult to believe the two could fit together under one umbrella. Ms. Hill did that. 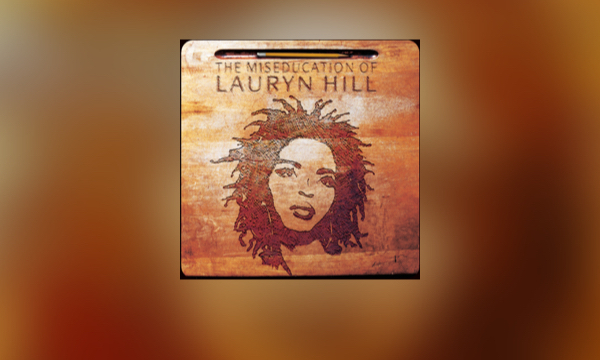 She planted the seed with “Killing Me Softly” on The Fugees’ The Score two years prior, but Miseducation sealed the deal, as its singles like “Doo Wop (That Thing)” and “Everything Is Everything” seamlessly integrated both singing and rapping. Lines were no longer drawn, and she’s the reason why versatile hip-hop artists like Drake self-admittedly exist. Before Miseducation, the only way you could reference God was through identifying as one under the Nation of Gods and Earths. Anything else was taboo or theoretically corny. It’s become a growing trend to namecheck God in any form in hip-hop nowadays. This was the year before Kanye dropped “Jesus Walks.” From Lecrae to Chance the Rapper, praising the Most High is not only seen as cool, but even necessary when it comes to celebrating success. Woven tightly within Miseducation are references to God, Psalms, and other pieces of Biblical scripture. Ms. Hill didn’t hold back at all. “To Zion” details her conversations with God as she dealt with her unplanned pregnancy. “Forgive Them Father” highlights wrongdoers and praying for their penance. “Final Hour” warns of judgment day, while “Tell Him” is Ms. Hill’s take on 1 Corinthians 13:4-8. God was omnipresent on Miseducation, and is now omnipresent in hip-hop. It proved the future was female. Queen Latifah, Monie Love, MC Lyte, Lil’ Kim, Foxy Brown. The list goes on and on of women in hip-hop who all made dramatic changes to an art form that arguably existed as a vessel for men to grow while women remained a novelty. Because of Ms. Hill’s lyrical dexterity coupled with her commercial appeal on Miseducation, she ultimately brought a brand new face to hip-hop: the face of a woman. Before Ms. Hill, it was “femcee this” and “femcee that,” and yes there was (and still is) some residual novelty of having women in the space. But Ms. Hill has what many male rappers (or mencees) never get: a Number One album. It added a newfound vulnerability to hip-hop’s bars. The album sales war of 2007 between Kanye West and 50 Cent is what many refer to as the shift in hip-hop’s emotional factor. Once Kanye was crowned king, artists like Kid Cudi and Drake were able to emote on record. But before that was even a twinkle in the glass of a recording studio booth’s window, it was Ms. Hill who poured her feelings into a hip-hop album. Miseducation tackles love lost and love found, distrust, pregnancy, and self-actualization. At 23 years old, Ms. Hill was the target age of today’s millennial—trying to “figure it all out”—and her project was seeped in feels. She may be decades removed from that demographic now, but many can still reference that moment in time and apply it to their own pivotal life moments. It renewed hip-hop’s live instrumentation. As part of The Fugees, Ms. Hill and her bandmates showed hip-hop in a whole new light: with guitars and drumsticks in hand. Sure, groups like Arrested Development and The Roots had already mastered that fusion, but what The Fugees did was package it for the greater public and create a whole new avenue for rappers to invigorate their sound. By the time Ms. Hill recorded Miseducation, she leveled up the instrumentation. Working with musicians like James Poyser and a then young John Legend (credited as John Stephens), Ms. Hill worked with taking instruments and slightly making them off-tune to achieve a deeper sound that most can only access with digital equipment. Now, when artists seek that full-bodied organic vibe, they turn to this project to remember that true Soul doesn’t require a beat machine and synthesizer. It established Ms. Lauryn Hill’s mic skills. Through The Fugees’ tracks, guest features, and deep cuts, fans knew that Ms. Hill could rap with immaculate proficiency. That much was for certain. But Miseducation truly made it known that Ms. Hill was an indomitable force on the mic. “Lost Ones,” the album’s opening track, was enough to determine her fate as one of the G.O.A.T.s. When an album opens with “It’s funny how money change a situation,” you know you’re in for a ride. Miseducation showed that L-Boogie could seamlessly navigate through beef and dismiss anyone who dared test her skills. No one can ever take that from her, and it’s the reason why she remains on many Top 5 Dead or Alive lists. It gave us a glimpse into “what happened” with The Fugees. After The Score, it felt like the no-brainer follow-up was Ms. Hill’s solo album and the presence of Wyclef and Pras on that project was imminent. Neither happened. Wyclef Jean released The Carnival in 1997, and while Ms. Hill was a part of the project, Clef was seemingly removed from The Miseducation narrative—at least in the recording process. We learned from that album’s lyrics just how tumultuous Jean and Ms. Hill’s ties were to each other. From the venom-spitting “Lost Ones” to “Ex-Factor,” it became clear that there was more than meets the eye/ear when it came to the two de-facto leaders of The Fugees and their clandestine relationship. More parts to that tale would unravel later on, but it was Miseducation that gave us all the inkling that something was amiss. It made Ms. Lauryn Hill’s years-long absence that much more painful. We can speculate on the events that followed the release of The Miseducation of Lauryn Hill that led to a noticeable change in her demeanor, but that would be a disrespect to the integrity of the project Ms. Hill delivered. We can point to late concert appearances, canceled tour dates, switches in song arrangements, and unnecessary jabs from less successful artists during local radio interviews but it won’t take away from the fact that what Ms. Hill created in 1998 was a work that stood the test of time. Fans hug it tightly, while artists bow in its presence when they’re recording their own works. Ms. Hill may never willfully make another Miseducation again, and that’s quite all right. We still have this one, and twenty years later, it’s still a masterpiece.